The World Health Organisation (WHO) rates India as one the leading competitors for the top place in highest incidence of heart diseases. It is said to reach the top by the end of 2020. This is where the need for regular cardiac check-up becomes necessary. Researches have shown that cardiovascular diseases have a high incidence among the people below 50 years as well. The irony is that most of these diseases are preventable to a great extent with proper monitoring of health factors. The lifestyle is a major contributor to these diseases. Our eating habits, diet, lack of exercise, stress and environmental factors affect the health of our heart. Heredity is known to play an important role as well. A regular cardiac check-up can analyse the condition of our heart to know if it is in the safe zone or not. 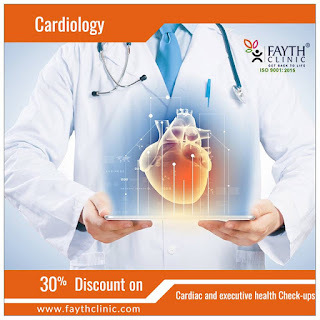 The check-up procedures for detecting cardiovascular irregularities comprises of a series of physical examination. They involve checking the patients respiratory function, pulse and heart beat and a talk with the consultant regarding any physical issues. A blood test is also conducted to check the patient’s blood sugar level, CBC, urea count, cholesterol level, lipid profile, creatinine level and so on. An ECG test can easily find out the irregularities with the heart function. 2D Echo is another procedure in cardiac check-up to check the heart function. X-rays, 24 hour ambulatory blood pressure and 24 hour Holter study are other cardiac check-up procedures to study heart function. Based in Mumbai, Maharashtra, India, Fayth Clinic is an ISO 9001:2015 certified clinic, that offers annual or pre-employment health check-ups. An advance cardiac unit with all modern diagnostic technologies, cardiac rehabilitation unit, other diagnostic services such as pathology, OPD consultations, physiotherapy and radiology or X-ray unit helps in providing a wholesome check-up package to the patients. The gym and spa unit in the hospital adds to the friendly and comfortable ambience of the clinic.